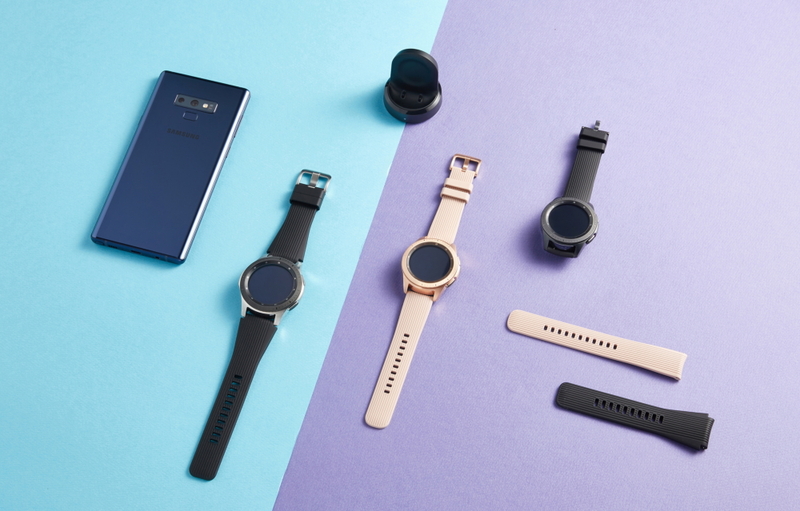 Samsung’s Galaxy Watch is a next-generation smartwatch that brings style and intelligence together in one handy device. Designed to match every lifestyle, the device offers new heights of personalization, real-time fitness and holistic health updates, and standalone freedom that lasts the whole day. To learn more about the benefits wearing the Galaxy Watch brings to daily life, the Newsroom got hands-on with the latest device in Samsung’s wearables lineup. With a design that embraces the look and feel of luxury watches, the Galaxy Watch’s trademark bezel is more detailed than before. 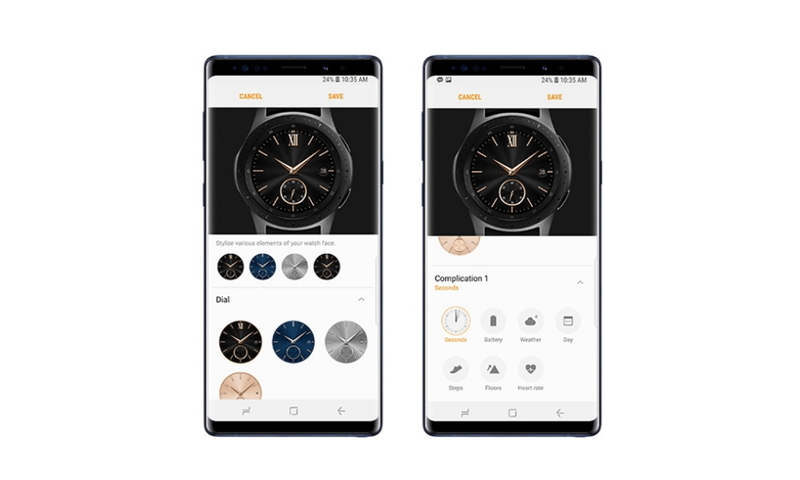 The smartwatch also caters to more preferences, as it is available in three different colors and two different sizes, Midnight Black (42mm), Rose Gold (42mm) and Silver (46mm), allowing you to personalize the device to suit your style or mood, from classic workwear to relaxed vacation looks. Each device comes with a silicone strap that winds smoothly around the wrist. Heightening customizability, three 22mm and eight 20mm original watch straps are available for purchase separately, with 14 more watch band options launched in collaboration with Switzerland’s Braloba in a range of materials, colors, and styles. The Galaxy Watch can also be fitted with standard watch straps1. 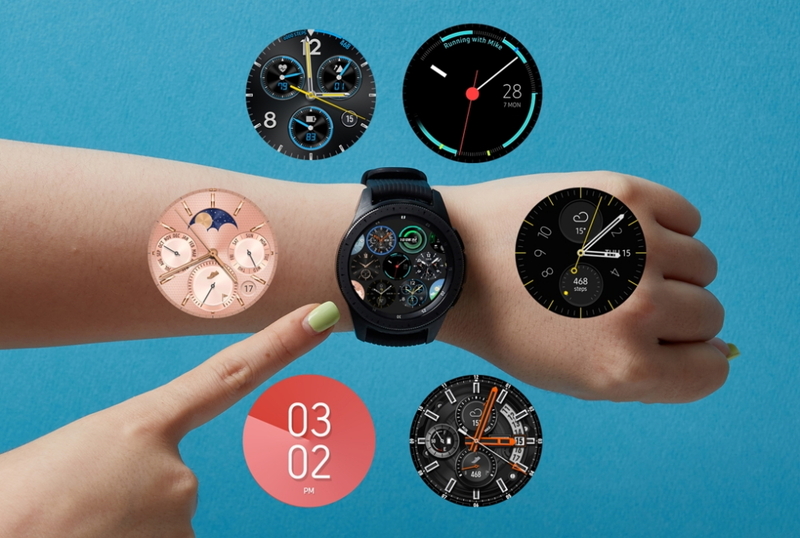 Setting different watch faces can transform the appearance of the Galaxy Watch. The 12 pre-loaded faces allow you to tailor your device to your mood in moments, while the approximately 60,000 additional faces available for download via the Galaxy Apps store provide limitless opportunities for adding your own personal flair. You can easily change your watch face on the Galaxy Watch itself or from a paired smartphone. There are also features, known as complications, that let the watch face show more just the time and date – and can be adjusted according to users’ preferences. The Galaxy Watch is equipped with a host of intuitive features that allow you to navigate the device with ease. The smartwatch’s screen will turn on as you raise your wrist, ready for you to view the information you need instantly. You can also explore installed apps by rotating the bezel, which allows for greater navigation control. No need to access your phone directly – the smartwatch enables you to make simple phone calls or reply to messages and vibrates lightly to notify you of incoming phone calls, messages, and alerts. 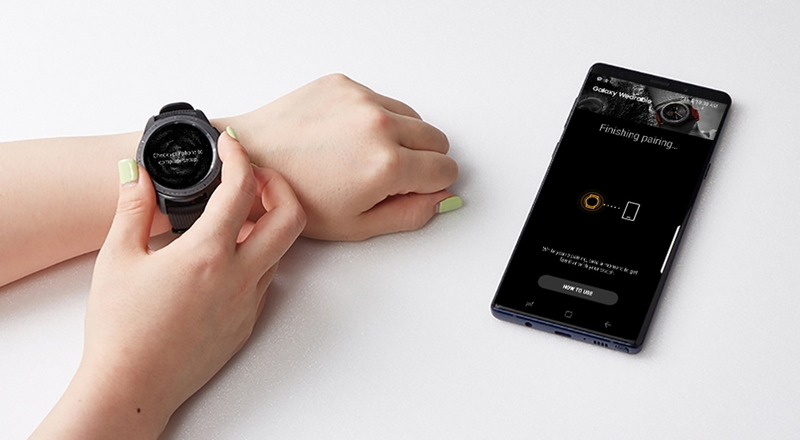 What’s more, when the Galaxy Watch is connected to Wifi or LTE, you can check your smartphone’s app notifications directly on the watch screen even while the phone is far away. 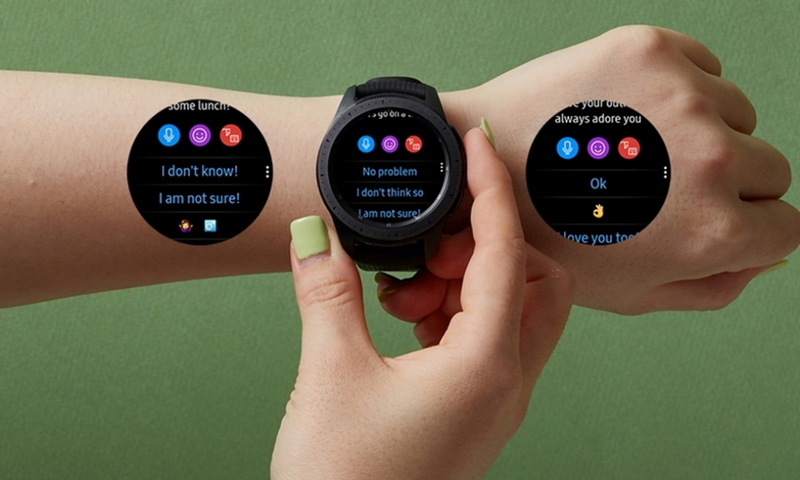 To reply to messages from your Galaxy Watch, you can select an answer from a variety of pre-drafted messages, type your response on the keyboard or use the built-in microphone to transform your voice into text. The Galaxy Watch can intuitively recommend appropriate responses, increasing your convenience. 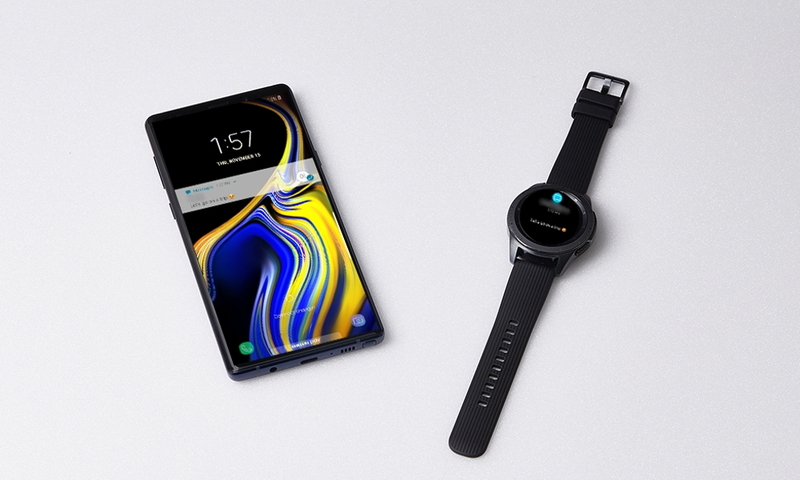 Pairing the Galaxy Watch and a smartphone is straightforward. Once you’ve downloaded and installed the Galaxy Wearable app on your smartphone, it will detect the smartwatch and prompt you to sync the two devices with each other. The Galaxy Watch is compatible with both Android and iOS smartphones2. Wearing the Galaxy Watch allows you to pay less attention to your smartphone while on the move. You can place your phone out of sight in your pocket or bag, knowing that you can receive notifications and send replies straight from the smartwatch’s screen. The Galaxy Watch helps you to manage your day, providing schedule reminders and encouraging you to meet your health and wellness goals. 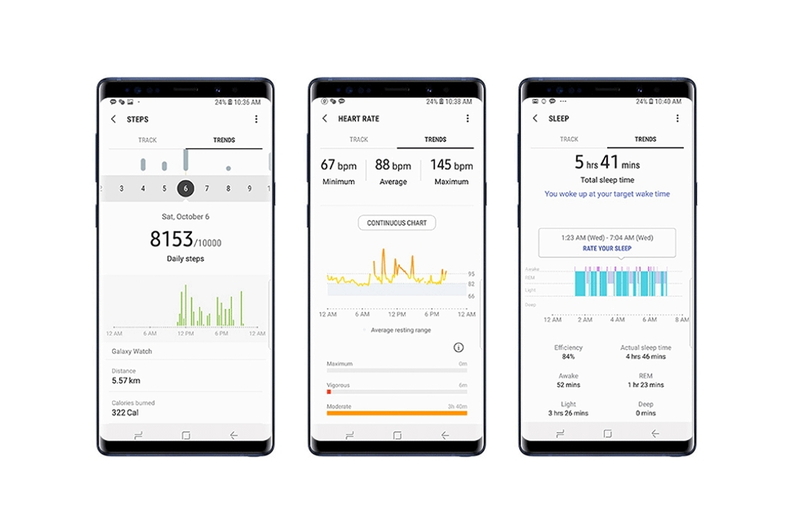 The Newsroom found the smartwatch’s advanced sleep tracker particularly useful, as the Galaxy Watch monitors four levels of sleep, including REM cycles, helping wearers to adjust their sleeping habits and get the rest they need. The device’s inactive time alerts remind wearers who have been sitting for a prolonged period of time to stand up and move around. The alerts suggest simple stretching exercise and provide little messages of encouragement to keep you motivated. With a variety of automatic sensors, the Galaxy Watch can monitor the wearer’s real-time health information. The smartwatch detects details such as your heart rate, global position and movements to measure and analyze your health status. The device’s accelerometer sensor, gyro sensor and the heart rate sensor can automatically recognize six types of activity – including walking, running and riding a bicycle, amongst others. The Galaxy Watch will begin to record information after 10 consecutive minutes of an activity and analyzes total activity to provide feedback for the wearer. The Galaxy Watch enables wearers to manage their time efficiently, with the ‘My Day’ watch face offering a clear overview of your daily schedule at a single glance and highlighting your appointment times at the edges of the dial. Synced to your smartphone’s calendar, the My Day watch face is designed to help you focus on a healthy work-life balance. Acting as your very own personal assistant, your Galaxy Watch prepares useful information briefings for you twice a day. The morning briefing is issued just after you typically wake up, providing details about the day’s weather and schedule. The evening briefing notifies wearers of any pending events amongst their reminders, offers a summary of health and activity data for that day, and displays the next day’s forecast. Endlessly tailorable and designed to meet your needs, the Galaxy Watch is ushering in a new era of wearables. The device is truly standalone, redefining freedom and connectivity, while helping you to achieve your ideal lifestyle balance. 1The Galaxy Watch is compatible with 20mm and 22mm standard watch straps for its 42mm and 46mm models, respectively. 2The Galaxy Watch is compatible with smartphones supporting Android OS 5.0 and above or iOS 9.0 and above. iOS smartphone users should to download the ‘Galaxy Watch’ application from iTunes.